Some finalists from the 2018 Photo Competition. 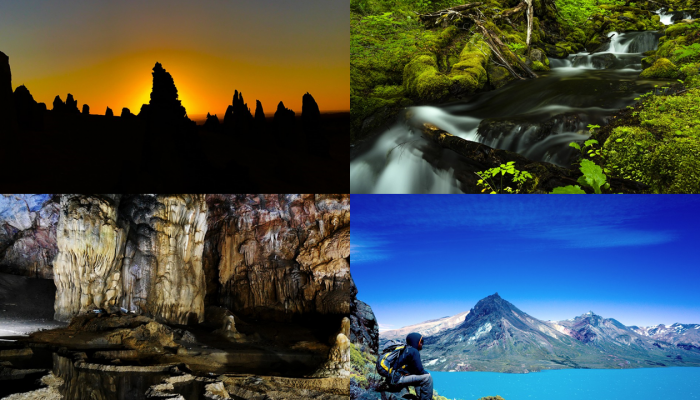 Clockwise from top left: Pinnacles in Nambug National Park at sunset by Stefan Doerr, Patagonian Rainforest by Carsten W. Mueller, Closer look at the deglaciation history of Lago Belgrano by Monika Mendelova, and Poetry of water shaped formations by Raphael Knevels (distributed via imaggeo.egu.eu). If you are pre-registered for the 2019 General Assembly (Vienna, 7-12 April), you can take part in our annual photo competition! Winners receive a free registration to next year’s General Assembly! But hurry, there are only a few days left to enter! Every year we hold a photo competition and exhibit in association with our open access image repository, Imaggeo, and our annual General Assembly. There is also a moving image competition, which features a short clip of continuous geoscience footage. Pre-registered conference participants can take part by submitting up to three original photos and/or one moving image on any broad theme related to the Earth, planetary and space sciences. Shortlisted photos will be exhibited at the conference, together with the winning moving image, which will be selected by a panel of judges. General Assembly participants can vote for their favorite photos and the winning images will be announced on the last day of the meeting. You will need to register on Imaggeo to upload your image, which will also be included in the database. When you’ve uploaded it, you’ll have the option to edit the image details – here you can enter it into the EGU Photo Contest – just check the checkbox! The deadline for submissions is 15 February. Previous winning photographs can be seen on the 2010, 2011, 2012, 2013, 2014, 2015, 2016, 2017, and 2018 winners’ pages. This was taken during a study, undertaken by me and my colleagues, on the sea ice of McMurdo Sound, Antarctica. We designed the project to document how supercooled water carrying suspended ice crystals flows along its pathway towards the open ocean. 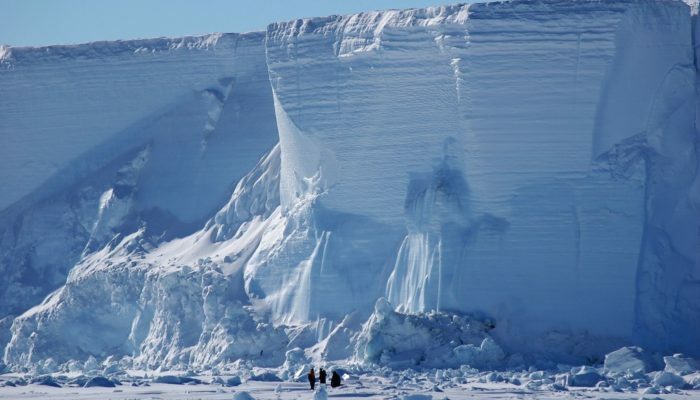 Ultimately, this work aims to assess the Ross Ice Shelf’s contribution of local melt to the long-term trend of increased sea ice cover around Antarctica – a signal which has been dominated by expansion in the Ross Sea. However, over the winter prior to the field season an iceberg, 12 kilometres long and 1 kilometre wide that had calved from the Ross Ice Shelf, grounded itself across the middle of our intended study region. This created a significant constriction to the flow, as the iceberg forced the approximately 30 km-wide plume to squeeze into half of that space. We quickly modified the objectives for the field season to take advantage of this, adding an element focusing on the fluid dynamics of accelerated large-scale flow around the tip of the iceberg, and another on the thermodynamics of the supercooled plume interacting with a deep wall of ice. These adjustments to our study required drilling several holes through the sea ice along lines that approached the iceberg from two different directions to collect the necessary oceanographic data. The iceberg towers about 40 m above the frozen sea surface, with our field support team providing scale as they scope a route of safe approach. However, hidden from sight by the sea ice, the iceberg stretches a further 170 m below the surface to the point where it is grounded on the seafloor. 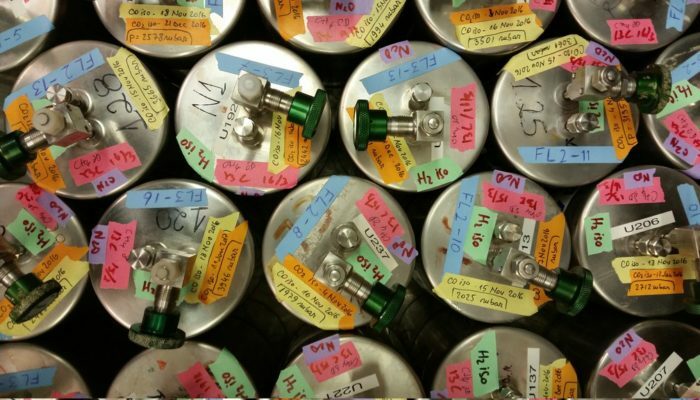 Conducting field science in Antarctica requires being able to adapt to a dynamic environment. In this case, our flexibility was rewarded with a unique data set – essentially a laboratory study in fluid mechanics on a real-world scale. Kielwasser / Wake behind FS Heincke. Credit: Markus Benninghoff (distributed via imaggeo.egu.eu). 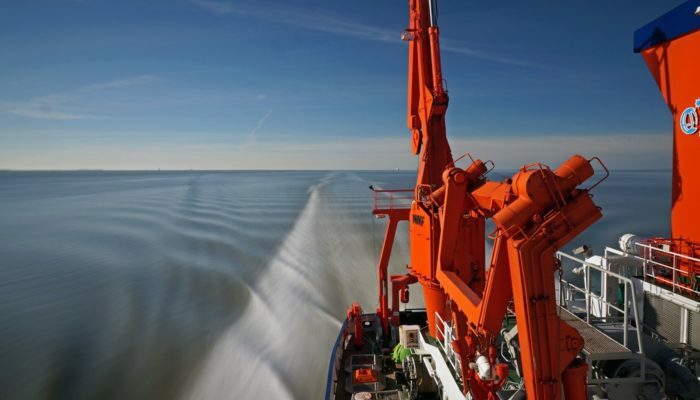 The picture was taken during the 2015 research cruise HE441 in the southern German Bight, North Sea. It features the research vessel Heincke, on a remarkably calm and warm spring day, forming a seemingly steady wake. The roughly 55 metre long FS Heincke, owned by the German federal government and operated by the Alfred Wegener Institute, provides a great platform for local studies of the North Sea shelf. Eleven scientists and students from the University of Bremen, MARUM Research Faculty, University of Kiel, and Federal Waterways Engineering and Research Institute, along with the ship’s crew formed a great team under the supervision of chief scientist Christian Winter. On deck, different autonomous underwater observatories were waiting to be deployed. Their purpose was to measure the seabed- and hydrodynamics in a targeted area of the German Bight. The investigation of the interaction between geomorphology, sedimentology and biogeochemistry is crucial to understand the processes acting on this unique and dynamic environment. In the German Bight various stakeholders with diverse interests come together. Profound knowledge, backed by cutting edge research, helps to resolve future conflicts between use and protection of the environment. While this photo features a tranquil day at sea, some days later the weather and wave conditions got so bad that the cruise had to be abandoned. Storm Niklas, causing wave heights of more than three metres, made deployment and recovery of the observatories too dangerous for the crew, scientists, and delicate instruments. Despite the severe weather, the research cruise was still able to gather important data with the time made available. Schedules on research vessels are tight and optimized to fit as much high-quality measurements as possible into time slots that are depending on convenient sea (tide) and weather conditions. State-of-the-art research equipment were prepared, deployed, recovered and assessed several times during the then only 8-day long cruise. Measurements were supported by ship based seabed mapping and water column profiling. Transit times, like the one depicted, were used to prepare the different sensors and instruments for the upcoming deployment. The rare occasion of good weather combined with idle time was utilized to take this long exposure photo. A calm sea, a stable clamp temporarily attached to a handrail, and a neutral density filter were additionally required to increase the exposure time of the camera to 13 seconds, in order to capture this picture. The long exposure time smooths all movement relative to the ship, enhancing the effect of the wake behind the Heincke vessel. Over the course of several years, regular Heincke research cruises and the collaboration between the different institutions has led to the successful completion of research projects, with findings being published in various journals, listed below.